Twelve-year-old Brendan is a child in a medieval abbey. He's fascinated by illuminated manuscripts and once he's met Aidan the illustrator, at work on the Book of Iona, embarks on a quest for the magical material for the inks. 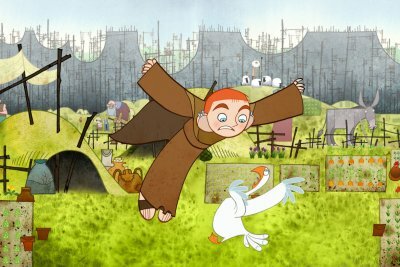 This well-crafted retro animation, with atmospheric music, has won a number of prizes including the Audience award at the 2009 Edinburgh Film Festival. A visual feast. Using the illuminated manuscripts of the Book of Kells and a host of other Celtic imagery as its inspiration, the result is an intricate and delicate - mostly hand-drawn look...an entertaining and accomplished debut.